1. Ensure you have the minimum amount of petrol as possible in the tank before tackling the work. The tank is not particularly heavy with only a few litres in it but would be a much harder to manoeuvre with half a tank or more sloshing about. 2. Lift the rear of the car up high as possible as the tank has to come downward and then sideway to remove from the chassis. The tank fuel filler pipes add a good bit to the height plus the tank will be sitting on a trolley jack to assist lowering/raising. I ran the car up on ramps, then jacked up and supported on stands the drivers side, then removed the ramp to gain access into the drivers wheel arch. 3. Remove the drivers side rear wheel and arch liner. 4. Remove the undertray and diffuser panel. 5. Undo the gear selection cables at the gear selector ends and cable clips. Note the direction of travel of the cables under the car and which part of the gear mechanism each cable end connects to. 7. Undo the accelerator cable at the throttle body. 9. Split the front part of the handbrake cable at the "horseshoe" bracket by removing the “R” clip and pushing the clevis pin out. 10. Push both the throttle cable, both gear cables and the handbrake cable forwards under the car to allow the tank to drop down. 12. Removing the old rubber filler hoses from the tank filler pipes is virtually impossible if they have not been off before. They are likely to be bonded to the tank filler pipes. It is common for the rubber hoses to have perished. Others have used boiling water on the old pipes to soften them (See Previous Instructions at end of this page), but once you see the room you have to work in the wheel arch, Personally, I wouldn't bother. Remove the rubber filler hoses completely ie undo at the fuel filler neck as well, and only refit them after the tank has been replaced. If you just undo the lower connections to the tank, you will struggle refitting the tank and reconnecting the hoses. Space and location make it very difficult. 14. Remove the inspection hatch behind the tank to access the top of the pump/ fuel and electrical connectors. Although you can see these connectors, they are a complete pain in the ar*e to undo. Better to drop the tank a cm or two (section 16) then go back and undo the connectors. You will have more space to get your hand through the inspection hatch without lacerating your fingers and wrist. The electrical connector has one tang that requires lifting and then it will come off the pump. Rotate the fuel connectors a few degrees each way to break the seal before you try to pull them off. 15. With the rubber filler pipes off and the inspection hatch open, support the centre of the tank with a trolley jack and a block of wood. Undo the 4 tank fixing bolts and remove. 16. Drop the tank a few cm's at the pump end (you'll probably find the filler pipe end will jam slightly as the hole in the chassis for them to pass through is tight so the tank will naturally drop at the fuel pump end first). Now go back into the car and undo the electrical and fuel connectors. 17. Under the car again and continue to slowly drop the tank. You may have to go back into the wheel arch to help push the filler pipes down through the chassis hole. The pump is help in compression by this ring. There are 3 springs inside the pump attempting to push the top of the pump upwards. 20. Remove the 8 mounting nuts by undoing them a few turns at a time rather than each one individually to allow the pump to rise evenly. One of the nuts is located under the pump outlets and requires the use of an open ended spanner initially. 21. Once the ring has been unbolted, the pump may be simply lifted out. Whenever the fuel pump is removed, ensure the 8 bolts are tightened up from inside the tank before refitting to avoid leaks. 22. The original tank is likely to have a lot of surface rust especially around the filler pipe area and the bottom corners. 24. If refurbishing the original tank, it is worth unbolting the lower ring, cleaning and resealing. The holes in this lower ring are threaded and it is held onto the tank by the 8 bolts, the heads are inside the tank. The lower ring is sealed to the tank with a layer of non setting fuel resistant liquid gasket eg blue hylomar. 25. Lift the tank on a trolley jack. Remember to reconnect the electrical and fuel pipes before raising completely into position. 26. Replace the 4 tank mounting bolts loosely. This will give you a bit of movement in the tank to aid fitting the rubber hoses to the tank filler pipes. 27. From within the wheel arch, fit the rubber hoses to the tank filler pipes and secure with jubilee clips, then back under the car and fully tighten the tank mounting bolts. 28. When refitting, the shear panel, ensure it is torqued up to the correct 24Nm. The panel is an integral part of the chassis support/stiffness. 29. 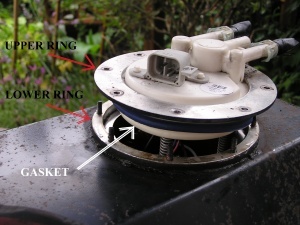 Replace the brake pipes behind the tank with non corroding Copper/Nickel pipe (Kunifer etc). You will never have to worry about them again. The brake pipes where they emerge from behind tank into the flow of road dirt and water in front of the rear wheels are the most common areas to rust through. 30. Think about a pump replacement if your car is high mileage. Spitfire Engineering, Eliseshop and Eliseparts all have upgraded or redesigned pumps. NOTE: This is best done when tank is empty or almost empty as otherwise tank will be heavy! Get car as high as possible on axle stands (I jack one side using middle jacking point, then place stands at front and rear sub frame jacking points on one side, then do the same on the other side. Remove r-clip from handbrake cable ‘horseshoe’ connector. At this point you can try to remove the pump connections as follows but my hands were far too big to make this possible! If you can’t just skip this step for now. This page was last modified on 23 February 2019, at 23:45.